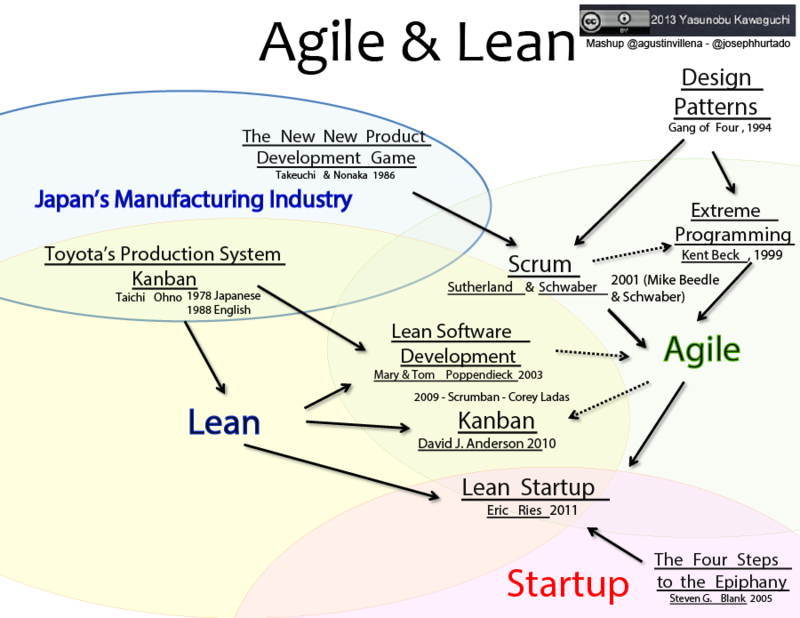 PEARL XII : Kanban : Application of Lean software development to Agile Methodologies. 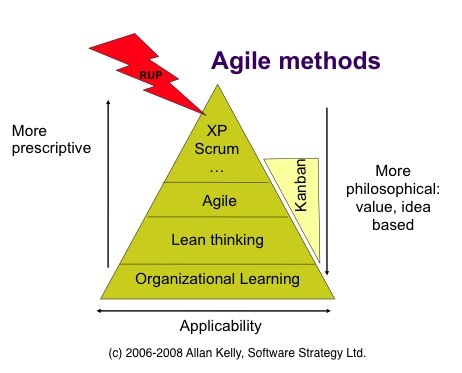 Most agile m­ethods such as Scrum and XP are already well aligned with lean principles. In 2004, David Anderson pioneered a more direct implementation of Lean Thinking and Theory of Constraints to software development. Under the guidance of experts such as Don Reinertsen, this evolved into what David called a “Kanban system for software development”, and which most people now simply refer to as “Kanban”. ­So while Kanban as applied to software development is new, Kanban as used in Lean Production is over a half century old. A software development lifecycle process or a project management process could be said to be “lean” if it was observed to be aligned with the values of the Lean Software Development movement and the principles of Lean Software Development. Lean eliminates waste through such practices as selecting only the truly valuable features for a system, prioritizing those selected, and delivering them in small batches. It emphasizes the speed and efficiency of development workflow, and relies on rapid and reliable feedback between programmers and customers. Lean uses the idea of work product being “pulled” via customer request. It focuses decision-making authority and ability on individuals and small teams, since research shows this to be faster and more efficient than hierarchical flow of control. Lean also concentrates on the efficiency of the use of team resources, trying to ensure that everyone is productive as much of the time as possible. It concentrates on concurrent work and the fewest possible intra-team workflow dependencies. Lean also strongly recommends that automated unit tests be written at the same time the code is written. Perhaps the most important Lean activity is to build a value stream map. This means to break down a process into individual steps, and identify which steps add value and which steps do not, thus adding to the waste (muda). The goal, then, is to eliminate the waste and improve the value-added steps (kaizen). An important lean tool helping to manage the work flow is the concept of pull system, which is usually visualized using a Kanban board. In general, we can define the Kanban software process as a WIP (Work In Process) limited pull system visualized by the Kanban board. In recent years, Lean Software Development has really emerged as its own discipline related to, but not specifically a subset of the Agile movement. This evolution started with the synthesis of ideas from Lean Product Development and the work of Donald G. Reinertsen and ideas emerging from the non-Agile world of large scale system engineering and the writing of James Sutton and Peter Middleton. David also synthesized the work of Eli Goldratt and W. Edwards Deming and developed a focus on flow rather than waste reduction . At the behest of Reinertsen around 2005, David introduced the use of kanban systems that limit work-in-progress and “pull” new work only when the system is ready to process it. Alan Shalloway added his thoughts on Lean software development in his 2009 book on the topic. Since 2007, the emergence of Lean as a new force in the progress of the software development profession has been focused on improving flow, managing risk, and improving (management) decision making. 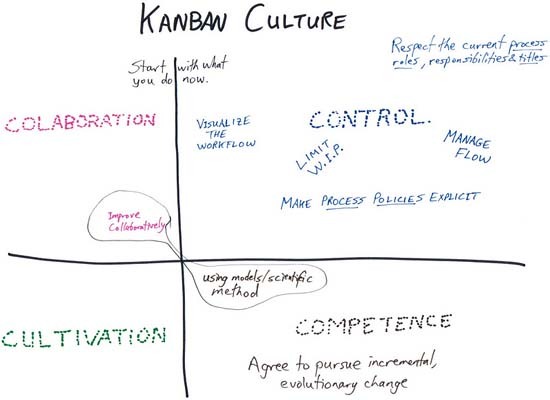 Kanban has become a major enabler for Lean initiatives in IT-related work. It appears that a focus on flow, rather than a focus on waste elimination, is proving a better catalyst for continuous improvement within knowledge work activities such as software development. Kanban is an agile methodology for managing the creation of products with an emphasis on continual delivery while not overburdening the development team. Like Scrum, Kanban is a process designed to help teams work together more effectively. Kanban is a method for managing knowledge work with an emphasis on just-in-time delivery while not overloading the team members. In this approach, the process, from definition of a task to its delivery to the customer, is displayed for participants to see and team members pull work from a queue. Kanban in the context of software development can mean a visual process management system that tells what to produce, when to produce it, and how much to produce inspired by the Toyota Production System and Lean manufacturing. The name ‘Kanban’ originates from Japanese and translates roughly as “signboard” or “billboard”. The Kanban method in one of the Kanban methods available today. It was formulated by David J. Anderson is an approach to incremental, evolutionary process and systems change for organizations. It uses a work-in-progress limited pull system as the core mechanism to expose system operation (or process) problems and stimulate collaboration to continuously improve the system. One example of such a pull system is a kanban system, and it is after this popular form of a work-in-progress, limited pull system that the method is named. The Kanban method does not prescribe a specific set of roles or process steps. The Kanban method starts with the roles and processes you have and stimulates continuous, incremental and evolutionary changes to your system. The Kanban method is a change management method. It is likely that the organization currently has some elements that work acceptably and are worth preserving. We must also seek to drive out fear in order to facilitate future change. By agreeing to respect current roles, responsibilities and job titles we eliminate initial fears. This should enable us to gain broader support for our Kanban initiative. Perhaps presenting Kanban against an alternative more sweeping approach that would lead to changes in titles, roles, responsibilities and perhaps the wholesale removal of certain positions will help individuals to realize the benefits. Kanban systems are an approach to scheduling work. Kanban shares with typical AMs the fact that requirements are expressed in atomic features (also known as user stories, work items, Minimum Marketable Features, or MMF), to be implemented incrementally. To this purpose, AMs use time-boxed iterations. – at the beginning of the iteration, the team meets and chooses features from their backlog that can be done by the end of the iteration. Over the course of the iteration, they develop those stories, and at the end of the iteration, they ship them . after the other. Work is delivered as soon as it’s ready, and the team only works on one – or very few – feature at a time. Anderson identified five core properties that had been observed in each successful implementation of the Kanban method. They were later relabeled as practices and extended with the addition of a sixth. The workflow of knowledge work is inherently invisible. Visualising the flow of work and making it visible is core to understanding how work proceeds. Without understanding the workflow, making the right changes is harder. A common way to visualise the workflow is to use a card wall with cards and columns. The columns on the card wall representing the different states or steps in the workflow. Limiting work-in-process implies that a pull system is implemented on parts or all of the workflow. The pull system will act as one of the main stimuli for continuous, incremental and evolutionary changes to your system. The pull system can be implemented as a kanban system, a CONWIP system, a DBR system, or some other variant. The critical elements are that work-in-process at each state in the workflow is limited and that new work is “pulled” into the new information discovery activity when there is available capacity within the local WIP limit. WIP limits encourage everyone to work as a team and prevent any one individual from getting too far ahead of anyone else. The flow of work through each state in the workflow should be monitored, measured and reported. By actively managing the flow the continuous, incremental and evolutionary changes to the system can be evaluated to have positive or negative effects on the system. Kanban elevates awareness of constraints and forces the team to address them before they can bring additional work into the queue. New work is pulled into the system when there is capacity to handle it, rather than being pushed into the system based on demand. With Kanban, the focus of management and the team becomes the flow of work, not the utilization of the team. While Scrum has retrospectives at the end of each iteration to address these items, Kanban explicitly points out constraints in real time and encourages the team to address them as they arise. Until the mechanism of a process is made explicit, it is often hard or impossible to hold a discussion about improving it. Without an explicit understanding of how things work and how work is actually done, any discussion of problems tends to be emotional, anecdotal and subjective. With an explicit understanding it is possible to move to a more rational, empirical, objective discussion of issues. This is more likely to facilitate consensus around improvement suggestions. Collaboration to review flow of work and demand versus capability measures, metrics and indicators coupled with anecdotal narrative explaining notable events is vital to enabling evolutionary change. Organizations that have not implemented the second level of feedback – the operations review – have generally not seen process improvements beyond a localized team level. As a result, they have not realized the full benefits of Kanban observed elsewhere. The Kanban method encourages small continuous, incremental and evolutionary changes that stick. When teams have a shared understanding of theories about work, workflow, process, and risk, they are more likely to be able to build a shared comprehension of a problem and suggest improvement actions which can be agreed by consensus. The Kanban method suggests that a scientific approach is used to implement continuous, incremental and evolutionary changes. Lean economic model (based on the concept of elimination of “waste” (or muda, muri and mura)). An open source, Agile and Lean based method to deliver value for knowledge work like Information Technology, Software Development, Business, Product Development or Personal organization. On the Lean side it is inspired on the work of Taiichi Ohno (Toyota Production System), Eliyahu Goldratt (Theory of Constraints) and Edward Deming. On the Agile side it takes inspiration from the Agile manifesto signers, and in addition contributions from Alan Shalloway’s Kanban for Teams, Corey Ladas Scrumban and David Anderson’s early Kanban work. It innovates by making the whole method fully open source and free to improve or modify. Open Kanban was written by Joseph Hurtado, and it has been translated by members of the community to French, Italian, Russian and Ukrainian. Agree on a set of goals for introducing Kanban. Define some point where you want to control input. Define what is upstream and who are the upstream stakeholders. Define some exit point beyond which you do not intend to control. Define a set of work items types based on the work requests that come from the upstream stakeholders. Analyze the demand for each work item type. Meet with the upstream and downstream stakeholders. Create a board/card wall to track the value stream you are controlling. Agree with the team to have a standup meeting in front of the board; invite upstream and downstream stakeholders . Agree to have regular operations review meeting for retrospective analysis of the process; invite upstream and downstream stakeholders . Train the team on the new board, WIP limits and the pull system. Nothing else in their world should have changed. VersionOne provides a single platform to manage all your projects, from Scrum to Kanban and everything in between, without sacrificing cross-project visibility. Visualize, manage and optimize your workflow using VersionOne’s custom Kanban boards. With some teams practicing Scrum and others choosing Kanban, it can be challenging for managers to get a clear, integrated view of status across all projects. VersionOne’s Kanban boards make it easy to manage all projects in a single tool without sacrificing cross-project visibility and consolidated reporting. When teams are practicing lean methods within iterations, VersionOne provides the Kanban capabilities to help agile teams visualize and manage their workflow processes. Agile teams can Create custom Kanban boards using named columns to illustrate each stage of workflow process, and an expedited track for high priority items. Work items are visually represented using story cards and can be pulled from prioritized queue and moved through the workflow easily using drag-and-drop software functionality. Managing the Kanban board in VersionOne provides real-time visibility for the entire team with full accessibility for remote members. Agile Teams see at a glance what work items are in progress and where they are in the development process. Visual cues within the Kanban board identify items that are blocked, held up in wait queue, or have exceeded their aging threshold, providing an early indicator of potential problems. VersionOne software helps maximize flow of work by setting explicit WIP limits across single or multiple contiguous columns to determine how many items can be worked on at each stage of process. Visual cues within the Kanban board lets team know when WIP limits are exceeded to trigger conversations and refocus the agile team’s efforts on the right work to ensure a continuous flow. VersionOne enables to Track and measure the average time to complete a work item using Cycle Cycle Time reporting capabilities. The ability to track cycle time metrics gives visibility into past performance to help increase the predictability of delivery and drive continuous process improvement. The Cycle Time clock starts when work begins on a request and ends when the item is ready for delivery. Cycle time is a mechanical measure of process capability. VersionOne can be used Identify and resolve bottlenecks using Cumulative Flow reports to see how well items are flowing through the process, Determine where work is stalled and where you should focus improvement efforts. The Cumulative Flow diagram provides a graphic depiction of how work items are moving through various statuses on the way to being “Done”. It shows the total scope of a project, grouped by status, and thus lets us know how much of that scope is in a particular status at a given time.